1. Preheat oven to 325°F. Place ham on rack in shallow roasting pan. 2. Stir together remaining ingredients in medium bowl; set aside. 3. Bake ham for 30 min. 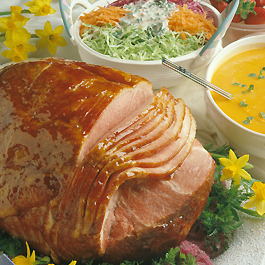 ; pour glaze over ham and continue to bake until ham is heated through, about a total of 2 1/2 hrs. (about 15-18 min. per pound).